Different diets work for different people. We've posted recipes for everything from lentil salad, herbal smoothies, and holiday recipes that can feed every eater at your table. There are a lot of different ways you can eat and be healthy. Today we're going to talk about one that has gained a lot of popularity lately—going grain-free. Beyond avoiding gluten or avoiding wheat, some people are seeing really good results when they eliminate grains altogether. Reducing inflammatory conditions is one of the common outcomes you'll hear from people who have gone this route. One problem with going grain-free, though, is that some of the processed alternatives you'll find in the grocery store aren't much better for you, or in some cases are worse. So you might try making your own grain-free recipes at home, maybe even attempting grain-free bread. If you've tried this, you know that it's hard. Recipes you find online may not have been as thoroughly tested as you'd think. And exact measurements are really important when you're doing any sort of gluten-free cooking. Our friend Kelly Herring went though this. After being diagnosed with non-celiac gluten sensitivity, she delved into the world of gluten-free baking. It helps that she has a background in nutritional biochemistry… It's an exact science! She founded the company Healing Gourmet and wrote a book called Better Breads, which is where the recipe we're sharing today comes from. Her book has 25 grain-free bread recipes, all thoroughly tested, beautifully photographed, and guaranteed to be a delicious part of your next meal. Plus, each recipe has nutritional info. Kelly has a lot to say about bread. She narrows it down to 5 lies you've have been told about bread in this article. 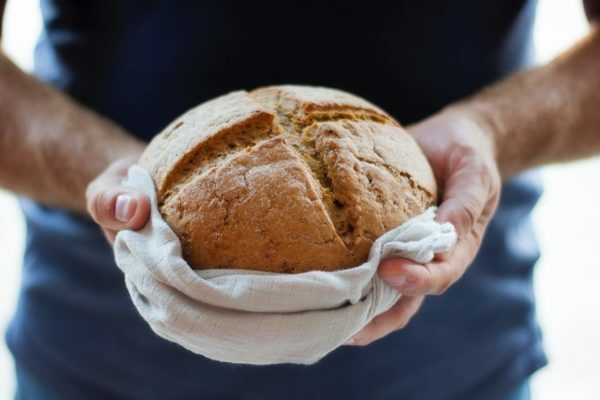 For 24 more recipes for all kinds of grain-free bread, check out Kelly's article and scroll down to the bottom for information on how to get your own electronic copy of her book, Better Breads. Read more on Better Breads here! Hello: I have not tried this recipe. But I’m giving it a whirl as I type. I’m curious why there isn’t a second proof after the first, but before the bake? The recipe goes straight from proof to forming to baking with no second proof after forming? Is a step missing there, or is this the intention? Looking foward to destroying (chowing down on) this loaf when it’s done. I’m starting with 1/2 the recipe to see how it goes. Thanks! i made this bread today and forgot to add the psyllium husk powder. the dough was very wet so I kept adding more flour and it didn’t really form a normal dough ball. I was going to bake it anyway because the ingredients are very expensive. I managed to roll the dough into balls and they tasted fine at the end. I made a second attempt and included the psyllium and less water. I added more water only after incorporating the dry and wet ingredients. it made two very small loaves and I think it tasted fine. I prefer the version without the psyllium though as it looked more appealing. this is the first non grain bread I’ve made and it’s edible for sure. I liked it. I tried this recipe today and the taste and texture were both great. The crispy crust made me want more so I had to put it away… and I’ve never been a bread lover. Unfortunately, my bread didn’t look like the one in the pictures. Mine was a flatter version; when I proofed my yeast, it wasn’t very bubbly so I think that was the problem. My yeast was well before the best before date but it wasn’t very lively. After I shaped the loaves to put in the oven, they sort of spread out instead of staying rounded. Regardless, I can’t wait to make this recipe again with newer/better yeast. I plan to make this recipe regularly… it was that good! Finally, a gluten free recipe that takes great and has great texture. I’ve tried many over the years and I’ve kept searching. I think my search is over. Well done and thank you! Curious what a serving size is for the nutritional facts? Can i substitute almond flour with quinoa flour? I cannot seem to get this bread to rise..I am at a loss what I am doing wrong…might try flaxseed instead of chia as there seems to be no fluid with chia..
Hey – I’m new to this recipe, but have baked a lot of bread, and this sounds like a yeast issue to me. Did your yeast foam up? If it didn’t, then it’s dead, and won’t make anything rise. I have a helluva time keeping yeast! It dies even when refrigerated, and I’ve brought home dead yeast from the store that would not proof! thank you for this recipe! When it was time to knead the dough, i couldnt because it was too sticky, not workable. i kept adding flour but just couldnt get it to a point that could be kneadable, so i did my best to sort of knead it in the bowl. anyone else have this problem? Also have you tried doubling or tripling the recipe? Thanks!! How big are the two loaves once baked? Once risen I only formed one loaf as it was only about 4-5 inch so otherwise would have made 2 small rolls.. but it was delicious!!!! I cannot tolerate chia seeds; what can I substitute? I had some trouble w/ the chia making the yeast concoction immediately gelatinous, thereby making it hard to knead all the dry/wet ingredients together. Checked all my quantities, can’t quite figure where I went wrong? However, it did turn out to be quite good! Made the bread yesterday and it is the best grain free bread recipe I have tried yet. It will be my go to recipe for bread from now on. Thank you! Is this your recipe or Dr. Eric Berg’s Healthiest Bread in the World? Who do I give the credit? Hey Crystal! We got this recipe from Kelly Herring. Hope you enjoy! Hi there you have a fantastic blog over here! Thanks for posting this interesting Recipe for us! If you keep up this great work I’ll visit your weblog again and i will share this post with my friends. Keep sharing..
Can this bread be made without the use of a pizza stone???? Mine was fine on a pre-heated cookie sheet. I made the loaf (just did one) on the parchment paper, and plopped it over onto the hot cookie sheet and baked it. Wondering how this would bake in a loaf pan, or even in roll-form in a glass dish? Yours recipies are very very healthy and goods. I made this bread twice with the original ingredients and the egg wash. The result is yummy, yet the breads were moist inside. Under baked? Third time I made it with flax meal (3 tbsp) as it gels like chia and psyllium husk and it turned out great too. Does the nutritional content apply to 1/16th of the recipe? This is THE BEST bread-even my very picky non-GF men loved it! Thank you!! Can a Kitchen Aid mixer with dough hook be used with this recipe? I have issues with arthritis in my hands, so stirring a thick dough is painful. Unfortunately, we do think that this dough needs to be kneaded. Mixing it in a blender will give you a different texture. That doesn’t mean you couldn’t try it and let us know, though. Just put your mixer on low and be careful not to over mix it. I can’t eat almond flour.. too inflammatory for me.. This bread, unlike every non-gluten recipe I’ve found online, actually bakes and tastes like real bread, due to the yeast it calls for. This makes a delightful pizza crust, as well. i CANNOT get onto your link showing the 5 reasons regarding the bread issue. please tell me how to access it. Hi! I’m sorry that you’re not able to open that link, it should work! I made this bread today and it is hands down the tastiest and most bread-like consistency of any grain free recipe I have tried before. The texture was chewy outside and soft inside, something I have yet to find in any other wheat free homemade bread. It holds up to slicing and dipping in soups. Thank you so much for the recipe. This is a keeper in my house. I’d love to try this bread recipe, however I don’t tolerate psyllium husk well and have read that repeated use can dehydrate the bowel. Is there anything that I can substitute instead? Thanks so much. I made it with flaxseed. 3 tbsp ground instead of chia and psillyum. Turned out great. I have had this book for several months now and have tried the recipes for a number of breads. Unfortunately, they never turn out to look like the illustrations. Even when following the instructions precisely, the breads don’t seem to rise and turn out rather dense.